AUCTION LOCATION: 1747 E. MARTIN LUTHER KING JR BLVD. SPIRO NO 1 FLAT OVAL STRETCHER WITH 14’’ TO 24’’ X 12FT MANDRELS IN INCREMENTS,AND 30’’ X 12FT MANDREL. UMC SMALL OVAL STRETCHER WITH ATTACHMENTS. SUTER NO. 2 RIBBED DUCT MACHINE WITH ATTACHMENTS AND MANDRELS. SUTER AG DELTA2 GORE CUTTING MACHINE WITH CONTROLS. IOWA PRECISION CUT TO LENGTH LINE, MODEL CTL-616, 60’’ X 16GA CAP,WITH UMC 4FT UNCOILER, CRADDLE CAR, AND CONTROLLER, S/N 58509. UMC SINGLE EDGE AND SLANT POST ELBOW MACHINES. UMC STRAIGHT POST ELBOW MACHINE. 2) MID RIVER MACHINE ROTARY MACHINE. 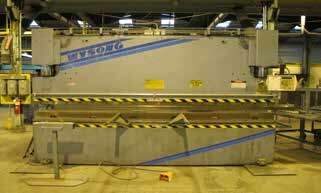 WYSONG MTH140-144, 12FT X 140 TON HYD CNC PRESS BRAKE, WITH AUTOGAGE 99 CNC BACK GAGE, S/N MT5-124. WYSONG 1010, 10FT X 10GA MECHANICAL POWER SHEAR. MONTGOMERY 6010, 60’’ X 10GA HYD INITIAL PINCH POWER ROLLS.\, S/N 061069. BUILT RITE MFG NEW DIMENSION P6.059, 6FT X 16GA INITIAL PINCH POWER ROLLS, S/N 07971587. MARVEL SPARTAN IW66D, 66 TON HYDRAULIC IRON ORKER. CYBERMATION GXA PLASMA CUTTING TABLE WITH HYPERTHERM PLASMA POWER SUPPLY, (2) 5FT X 10FT TABLES. BANNER 150 KVA SEAM WELDER WITH ENTRON CONTROLS. ACME 3-30-75 75 KVA SPOT WELDER WITH CONTROLS. THERMAL ARC 5XR PLASMA CUTTING MACHINE. LINCOLN IDEAL ARC TIG WELDER. BLISS NO. 4 OBI PUNCH PRESS. CHICAGO 8FT X 16 GA HAND BRAKE. LOCKFORMER ROLL FORMERS, DRILL PRESSES. YALE 5000 LB LPG FORKLIFT WITH PNEUMATIC TIRES, SIDE SHIFT, APPROX 1600 HOURS, 2 STAGE. KOMATSU 5000 LB LPG FORKLLIFT WITH PNEUMATIC TIRES SIDE SHIFT, APPROX 2800 HOURS. PALLET RACKING, CANTELEVER RACKS, BINS, HOPPERS. MSI 10,000 LB FLOOR SCALE.